A quick internet research on mulberries reveal that they are one of the best fruits to eat. Mulberries contain resveratrol, the same ingredient that makes red wine so healthy. They, as you can imagine, are also high in antioxidants, vitamins, and fiber, all the things that are so very good for you. Mulberries can help you improve your sight, digestive system, cholesterol, blood sugar levels, immune system, and even prevent cancer! So since we have a giant mulberry tree at our new house, I've been fighting off the birds and the squirrels to harvest these tasty little morsels all week. 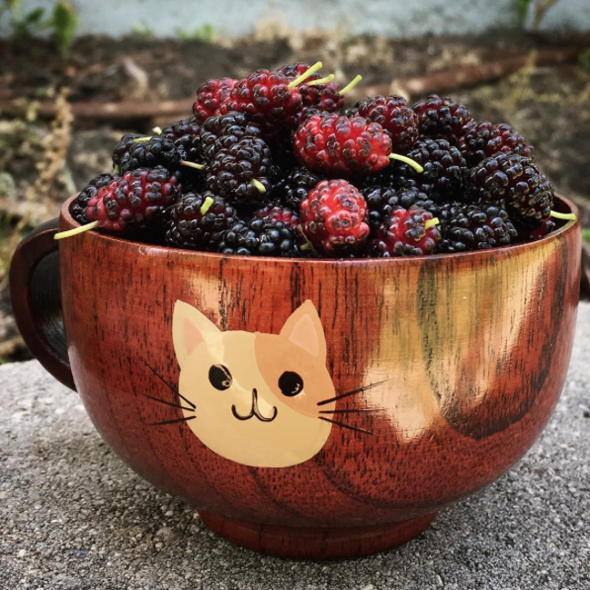 If you have a mulberry tree nearby, harvest away! You can turn the mulberries that you don't eat into jam, or dehydrate them to snack on later. 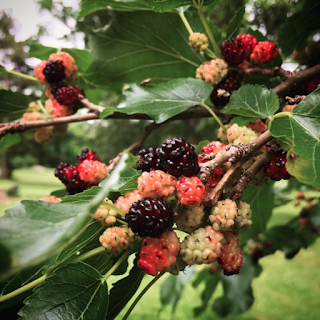 There are really only two things to note: 1) The darker the skin, the sweeter the berry; 2) Zach and I ate a couple of handfuls before we noticed the microscopic bugs that crawl all over the mulberries. Soaking then rinsing the mulberries in some salt water will take care of the critters, so nothing to worry about!